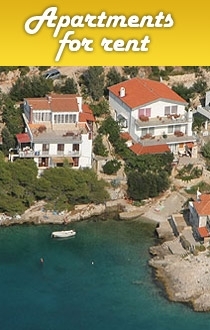 House with a beautiful view of the sea and islands for sale. The house is situated in the village of Zavala on the south side of Hvar, of one of the most beautiful islands in Croatia. It lies less than a 5 minute walk from beautiful beaches. The house has 69 m2 of indoor space and consists of two apartments on two floors with separate entrances as well as three large terraces overlooking the sea and a separate pantry. The plot is 554 m² with plenty of space to park several cars in the driveway as well as a possibility of putting in a pool in front of the house. The larger upstairs apartment consists of two large terraces, a kitchen, dining room, large bedroom, a living room that can be used as a second bedroom and a bathroom. The downstairs guest apartment consists of a kitchen, a living room, bedroom and bathroom. The apartments are new, modern and tastefully furnished using high-quality materials. Both apartments are air-conditioned, the bathrooms have underfloor heating installed. All the terraces have open views of the sea. The house also has a separate pantry with an additional stove and washing machine and an outdoor shower. The biggest advantage of the house is its beautiful location offering magnificent views as well as a peaceful atmosphere even in high season despite its proximity to infrastructure and amenities.